Uganda overcame a late scare to defeat Morocco 47-29 in the 2018 Africa Gold cup match played at Kyadondo Grounds on Saturday. John Duncan’s men survived a late comeback thanks to Pius Ogena and Solomon Okia’s two late tries (one apiece) that created an unassailable lead en route to the final whistle. Morocco had begun on the back foot when Phillip Wokorach opened the hosts’ account early but a second half surge by the visitors saw them come close to within three. Uganda required five tries from Ogena (2), Micheal Wokorach, Ivan Magomu and Okia to claim a bonus point victory. Phillip – who scored all Uganda’s penalties (three) and conversions (five), put up the Pearl’s first points when he kicked through a penalty in the third minute. Magomu later found well positioned Puis Ogena who broke through easily to touch down for the first try of the game. Morocco replied immediately as Micheal, Justin Kimono and Aaron Ofoyrwoth were beaten to the white chalk and when Noufal El Kadir successfully slotted in the conversion, the visitors were well back into the game. The North Africans soon made another infringement and Phillip used this opportunity to further extend the score to 13-07 off the tee. Eliphaz Emong and Ogena later paired up brilliantly – exchanging crisp passes as they drew closer to the white wash but referee Rasta Rasivhenge halted proceedings for a knock-on. Uganda got another chance through Kimono who should have easily crushed over in the right wing but the star was bundled out on his way to the try line. Phillip made four in four when he capitalized on another mistake to post more three on the scoreboard just before Micheal placed it past the chalk after receiving from Okia who had outpaced his opponent on a loose ball. Magomu closed out first half action when Paul Ssekate released him for Uganda’s third try in between the uprights. The scoreboard read “Uganda 30-7 Morocco” as both sides strolled off the pitch for the mandatory break. On return from team pep talk, Morocco ran riot. Houcine Amroui broke Uganda’s defence open with powerful play to score a try. Even though it wasn’t converted successfully, Samir Janoui‘s efforts led to another following a heavy maul at the left corner of Uganda’s half. A medical break helped Uganda refresh and relax with Phillip’s successful penalty thereafter but Mounaim Bachar further struck, El Kadir delivering the extras. Morocco raised complaints of their player who was deemed not fit to continue under the directive of referee Rasta and his medical team. After a three minute long stand-off, the Ugandan crowd grew cold when Morocco closed the gap further when El Kadir kicked to put the home side with in within three points. However, Ogena sent the crowds into jubilation when he raced to restore a sizeable gap. Okia then sealed the win – beating three men to sprint round the Moroccan 22 metres to touch in-between the posts. Uganda who can now only settle for third place after Kenya’s 67-0 win over Tunisia – will face Zimbabwe in their last game of this year’s Gold Cup tournament next weekend. They have won two of their opening four games in this year’s competition. Uganda currently seats third with 10 points on the log while Namibia leads with 20, Kenya second with 17. 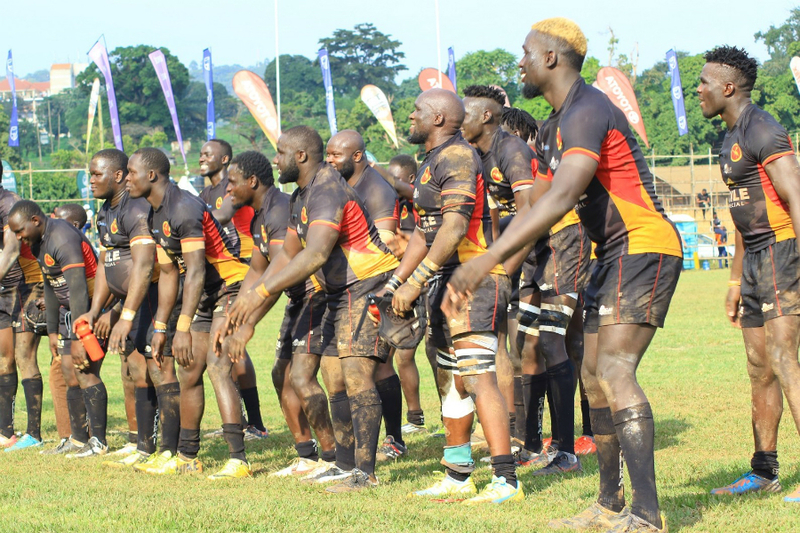 The maximum points Uganda can get against Zimbabwe are five which will not be enough to dislodge Kenya or Namibia in case any finishes second. After the final round of matches, the first place team will qualify for the World Cup directly, while the 2nd place team will qualify for the Repechage competition.